Matt Adams - Superheroes, Sci-Fi, and a Touch of the Fantastic: Crimsonstreak Tour 2012 Dates Confirmed! 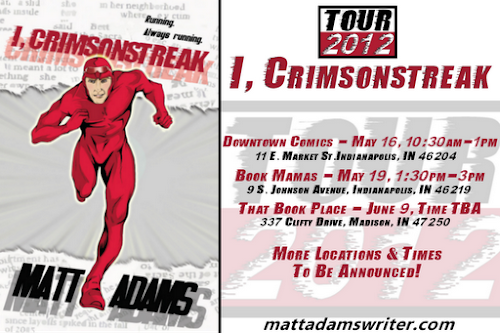 I've been in the process for the last few weeks trying to secure some book signings for I, Crimsonstreak, and I'm happy to announce today that three signings are confirmed! The Quasi-Official Launch Party is set for the Downtown Comics Market Street location on May 16 from 10:30am-1pm. On Saturday, May 19, I'll be at Book Mamas in Irvington from 1:30pm-3pm for another signing. On Saturday, June 9, I'll be in Madison, Indiana, at That Book Place. Times are still being worked out for that one. If you can't make it to any of those, I anticipate adding several more locations throughout the summer.